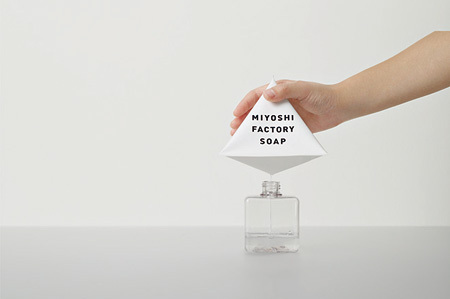 Mr. Haruo Miki, the CEO of Miyoshi Soap Corporation, says "Since our company is specialized in soap production, our wish is to bring just made fresh soap to customers as soon as possible" admirably, Miyoshi factory soap has made this wish come true. Mr Miki continue, "freshness is not only a value in food. Soap uses fresh ingredient such as vegetable oil and the just made one is in the best condition. " It is really the 'just made' and 'direct from the factory' fresh soap. It is liquid soap for refill purpose and does not have its own bottle. It comes only with the inside which is made out from natural ingredients. That is why the package is a simple paper regular tetrahedron package. There a type with no fragrance and two types with fragrances. With its simple attractiveness, it ask the user what is soap and how is it should be. The natural matching of the concept, package and the content is likeable and the design shows a good minimalism.